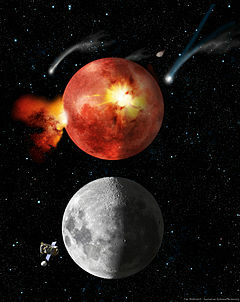 Artist's impression of the Moon during the Late Heavy Bombardment (above) and today (below). The Late Heavy Bombardment (abbreviated LHB and also known as the lunar cataclysm) is an event thought to have occurred approximately 4.1 to 3.8 billion years (Ga) ago, at a time corresponding to the Neohadean and Eoarchean eras on Earth. During this interval, a disproportionately large number of asteroids are theorized to have collided with the early terrestrial planets in the inner Solar System, including Mercury, Venus, Earth, and Mars. The Late Heavy Bombardment happened after the Earth and other rocky planets had formed and accreted most of their mass, but still quite early in Earth's history. Evidence for the LHB derives from lunar samples brought back by the Apollo astronauts. Isotopic dating of Moon rocks implies that most impact melts occurred in a rather narrow interval of time. Several hypotheses attempt to explain the apparent spike in the flux of impactors (i.e. asteroids and comets) in the inner Solar System, but no consensus yet exists. The Nice model, popular among planetary scientists, postulates that the giant planets underwent orbital migration and in doing so, scattered objects in the asteroid and/or Kuiper belts into eccentric orbits, and into the path of the terrestrial planets. Other researchers argue that the lunar sample data do not require a cataclysmic cratering event near 3.9 Ga, and that the apparent clustering of impact-melt ages near this time is an artifact of sampling materials retrieved from a single large impact basin. They also note that the rate of impact cratering could differ significantly between the outer and inner zones of the Solar System. The main piece of evidence for a lunar cataclysm comes from the radiometric ages of impact melt rocks that were collected during the Apollo missions. The majority of these impact melts are believed to have formed during the collision of asteroids or comets tens of kilometres across, forming impact craters hundreds of kilometres in diameter. The Apollo 15, 16, and 17 landing sites were chosen as a result of their proximity to the Imbrium, Nectaris, and Serenitatis basins, respectively. The apparent clustering of ages of these impact melts, between about 3.8 and 4.1 Ga, led to postulation that the ages record an intense bombardment of the Moon. They called it the "lunar cataclysm" and proposed that it represented a dramatic increase in the rate of bombardment of the Moon around 3.9 Ga. If these impact melts were derived from these three basins, then not only did these three prominent impact basins form within a short interval of time, but so did many others based on stratigraphic grounds. At the time, the conclusion was considered controversial. As more data has become available, particularly from lunar meteorites, this theory, while still controversial, has gained in popularity. The lunar meteorites are believed to randomly sample the lunar surface, and at least some of these should have originated from regions far from the Apollo landing sites. Many of the feldspathic lunar meteorites probably originated from the lunar far side, and impact melts within these have recently been dated. Consistent with the cataclysm hypothesis, none of their ages was found to be older than about 3.9 Ga. Nevertheless, the ages do not "cluster" at this date, but span between 2.5 and 3.9 Ga. Dating of howardite, eucrite and diogenite (HED) meteorites and H chondrite meteorites originating from the asteroid belt reveal numerous ages from 3.4–4.1 Ga and an earlier peak at 4.5 Ga. The 3.4–4.1 Ga ages has been interpreted as representing an increase in impact velocities as computer simulations using hydrocode reveal that the volume of impact melt increases 100–1,000 times as the impact velocity increases from the current asteroid belt average of 5 km/s to 10 km/s. Impact velocities above 10 km/s require very high inclinations or the large eccentricities of asteroids on planet crossing orbits. Such objects are rare in the current asteroid belt but the population would be significantly increased by the sweeping of resonances due to giant planet migration. Studies of the highland crater size distributions suggest that the same family of projectiles struck Mercury and the Moon during the Late Heavy Bombardment. If the history of decay of late heavy bombardment on Mercury also followed the history of late heavy bombardment on the Moon, the youngest large basin discovered, Caloris, is comparable in age to the youngest large lunar basins, Orientale and Imbrium, and all of the plains units are older than 3 billion years. While the cataclysm hypothesis has recently gained in popularity, particularly among dynamicists who have identified possible causes for such a phenomenon, the cataclysm hypothesis is still controversial and based on debatable assumptions. Two criticisms are that (1) the "cluster" of impact ages could be an artifact of sampling a single basin's ejecta, and (2) that the lack of impact melt rocks older than about 4.1 Ga is related to all such samples having been pulverized, or their ages being reset. The first criticism concerns the origin of the impact melt rocks that were sampled at the Apollo landing sites. While these impact melts have been commonly attributed to having been derived from the closest basin, it has been argued that a large portion of these might instead be derived from the Imbrium basin. The Imbrium impact basin is the youngest and largest of the multi-ring basins found on the central nearside of the Moon, and quantitative modeling shows that significant amounts of ejecta from this event should be present at all of the Apollo landing sites. According to this alternative hypothesis, the cluster of impact melt ages near 3.9 Ga simply reflects material being collected from a single impact event, Imbrium, and not several. Additional criticism also argues that the age spike at 3.9 Ga identified in 40Ar/39Ar dating could also be produced by an episodic early crust formation followed by partial 40Ar losses as the impact rate declined. A second criticism concerns the significance of the lack of impact melt rocks older than about 4.1 Ga. One hypothesis for this observation that does not involve a cataclysm is that old melt rocks did exist, but that their radiometric ages have all been reset by the continuous effects of impact cratering over the past 4 billion years. Furthermore, it is possible that these putative samples could all have been pulverized to such small sizes that it is impossible to obtain age determinations using standard radiometric methods. Latest reinterpretation of crater statistics suggests that the flux on the Moon and on Mars may have been lower in general. Thus, the recorded crater population can be explained without any peak in the earliest bombardment of the inner Solar System. Before the formulation of the LHB theory, geologists generally assumed that the Earth remained molten until about 3.8 Ga. This date could be found in many of the oldest-known rocks from around the world, and appeared to represent a strong "cutoff point" beyond which older rocks could not be found. These dates remained fairly constant even across various dating methods, including the system considered the most accurate and least affected by environment, uranium–lead dating of zircons. As no older rocks could be found, it was generally assumed that the Earth had remained molten until this date, which defined the boundary between the earlier Hadean and later Archean eons. Nonetheless, more recently, in 1999, the oldest known rock on Earth was dated to be 4.031 ± 0.003 billion years old, and is part of the Acasta Gneiss of the Slave Craton in northwestern Canada. Older rocks could be found, however, in the form of asteroid fragments that fall to Earth as meteorites. Like the rocks on Earth, asteroids also show a strong cutoff point, at about 4.6 Ga, which is assumed to be the time when the first solids formed in the protoplanetary disk around the then-young Sun. The Hadean, then, was the period of time between the formation of these early rocks in space, and the eventual solidification of the Earth's crust, some 700 million years later. This time would include the accretion of the planets from the disk and the slow cooling of the Earth into a solid body as the gravitational potential energy of accretion was released. Later calculations showed that the rate of collapse and cooling depends on the size of the rocky body. Scaling this rate to an object of Earth mass suggested very rapid cooling, requiring only 100 million years. The difference between measurement and theory presented a conundrum at the time. The LHB offers a potential explanation for this anomaly. Under this model, the rocks dating to 3.8 Ga solidified only after much of the crust was destroyed by the LHB. Collectively, the Acasta Gneiss in the North American cratonic shield and the gneisses within the Jack Hills portion of the Narryer Gneiss Terrane in Western Australia are the oldest continental fragments on Earth, yet they appear to post-date the LHB. The oldest mineral yet dated on Earth, a 4.404 Ga zircon from Jack Hills, predates this event, but it is likely a fragment of crust left over from before the LHB, contained within a much younger (~3.8 Ga old) rock. The Jack Hills zircon led to something of a revolution in our understanding of the Hadean eon. Older references generally show that Hadean Earth had a molten surface with prominent volcanos. The name "Hadean" itself refers to the "hellish" conditions assumed on Earth for the time, from the Greek Hades. Zircon dating suggested, albeit controversially, that the Hadean surface was solid, temperate, and covered by acidic oceans. This picture derives from the presence of particular isotopic ratios that suggest the action of water-based chemistry at some time before the formation of the oldest rocks (see Cool early Earth). Of particular interest, Manfred Schidlowski argued in 1979 that the carbon isotopic ratios of some sedimentary rocks found in Greenland were a relic of organic matter. There was much debate over the precise dating of the rocks, with Schidlowski suggesting they were about 3.8 Ga old, and others suggesting a more "modest" 3.6 Ga. In either case it was a very short time for abiogenesis to have taken place, and if Schidlowski was correct, arguably too short a time. The Late Heavy Bombardment and the "re-melting" of the crust that it suggests provides a timeline under which this would be possible; life either formed immediately after the Late Heavy Bombardment, or more likely survived it, having arisen earlier during the Hadean. Recent studies suggest that the rocks Schidlowski found are indeed from the older end of the possible age range at about 3.85 Ga, suggesting the latter possibility is the most likely answer. More recent studies have found no evidence for the isotopically light carbon ratios that were the basis for the original claims. More recently, a similar study of Jack Hills rocks shows traces of the same sort of potential organic indicators. Thorsten Geisler of the Institute for Mineralogy at the University of Münster studied traces of carbon trapped in small pieces of diamond and graphite within zircons dating to 4.25 Ga. The ratio of carbon-12 to carbon-13 was unusually high, normally a sign of "processing" by life. Three-dimensional computer models developed in May 2009 by a team at the University of Colorado at Boulder postulate that much of Earth's crust, and the microbes living in it, could have survived the bombardment. Their models suggest that although the surface of the Earth would have been sterilized, hydrothermal vents below the Earth's surface could have incubated life by providing a sanctuary for heat-loving microbes. In April 2014, scientists reported finding evidence of the largest terrestrial meteor impact event to date near the Barberton Greenstone Belt. They estimated the impact occurred about 3.26 billion years ago and that the impactor was approximately 37 to 58 kilometres (23 to 36 miles) wide. The crater from this event, if it still exists, has not yet been found. Simulation showing outer planets and planetesimal belt: a) Early configuration, before Jupiter (green) and Saturn (orange) reach 2:1 resonance b) Scattering of planetesimals into the inner Solar System after the orbital shift of Neptune (dark blue) and Uranus (light blue) c) After ejection of planetesimals by planets. In the Nice model the Late Heavy Bombardment is the result of a dynamical instability in the outer Solar System. The original Nice model simulations by Gomes et al. began with the Solar System's giant planets in a tight orbital configuration surrounded by a rich trans-Neptunian belt. Objects from this belt stray into planet crossing orbits causing the orbits of the planets to migrate over several hundred million years. Jupiter and Saturn's orbits drift apart slowly until they cross a 2:1 orbital resonance causing the eccentricities of their orbits to increase. The orbits of the planets become unstable and Uranus and Neptune are scattered onto wider orbits that disrupt the outer belt, causing a bombardment of comets as they enter planet crossing orbits. Interactions between the objects and the planets also drive a faster migration of Jupiter and Saturn's orbits. This migration causes resonances to sweep through the asteroid belt, increasing the eccentricities of many asteroids until they enter the inner Solar System and impact the terrestrial planets. The Nice model has undergone some modification since its initial publication. The giant planets now begin in a multi-resonant configuration due an early gas-driven migration through the protoplanetary disk. Interactions with the trans-Neptunian belt allow their escape from the resonances after several hundred million years. The encounters between planets that follow include one between an ice giant and Saturn the that propels the ice giant onto a Jupiter-crossing orbit followed by an encounter with Jupiter that drives the ice giant outward. This jumping-Jupiter scenario quickly increases the separation of Jupiter and Saturn, limiting the effects of resonance sweeping on the asteroids and the terrestrial planets. While this is required to preserve the low eccentricities of the terrestrial planets and avoid leaving the asteroid belt with too many high eccentricity asteroids, it also reduces the fraction of asteroids removed from the main asteroid belt, leaving a now nearly depleted inner band of asteroids as the primary source of the impactors of the LHB. The ice giant is often ejected following its encounter with Jupiter leading some to propose that the Solar System began with five giant planets. Recent works, however, have found that impacts from this inner asteroid belt would be insufficient to explain the formation of ancient impact spherule beds and the lunar basins, and that the asteroid belt was probably not the source of the Late Heavy Bombardment. According to one planetesimal simulation of the establishment of the planetary system, the outermost planets Uranus and Neptune formed very slowly, over a period of several billion years. Harold Levison and his team have also suggested that the relatively low density of material in the outer Solar System during planet formation would have greatly slowed their accretion. This "late appearance" of these planets has therefore been suggested as a different reason for the LHB. However, recent calculations of gas-flows combined with planetesimal runaway growth in the outer Solar System imply that Jovian planets formed extremely rapidly, on the order of 10 My, which does not support this explanation for the LHB. The Planet V hypothesis posits that a fifth terrestrial planet created the Late Heavy Bombardment when its meta-stable orbit entered the inner asteroid belt. The hypothetical fifth terrestrial planet, Planet V, had a mass less than half of Mars and originally orbited between Mars and the asteroid belt. Planet V's orbit became unstable due to perturbations from the other inner planets causing it to intersect the inner asteroid belt. After close encounters with Planet V, many asteroids entered Earth-crossing orbits producing the Late Heavy Bombardment. Planet V was ultimately lost, likely plunging into the Sun. In numerical simulations, an uneven distribution of asteroids, with the asteroids heavily concentrated toward the inner asteroid belt, has been shown to be necessary to produce the LHB via this mechanism. An alternate version of this hypothesis in which the lunar impactors are debris resulting from Planet V impacting Mars, forming the Borealis Basin, has been proposed to explain a low number of giant lunar basins relative to craters and a lack of evidence of cometary impactors. A hypothesis proposed by Matija Ćuk posits that the last few basin-forming impacts were the result of the collisional disruption of a large Mars-crossing asteroid. This Vesta-sized asteroid was a remnant of a population which initially was much larger than the current main asteroid belt. Most of the pre-Imbrium impacts would have been due to these Mars-crossing objects, with the early bombardment extending until 4.1 billion years ago. A lull in basin-forming impacts then followed during which the lunar magnetic field decayed. Then roughly 3.9 billion years ago a catastrophic impact disrupted the Vesta-sized asteroid radically increasing the population of Mars-crossing objects. Many of these objects then evolved onto Earth-crossing orbits producing a spike in the lunar impact rate during which the last few lunar impact basins are formed. Ćuk points to the weak or absent residual magnetism of the last few basins and a change in the size-frequency distribution of craters which formed during this late bombardment as evidence supporting this hypothesis. The timing and the cause of the change in the size-frequency distribution of craters is controversial. A number of other possible sources of the Late Heavy Bombardment have been investigated. Among these are additional Earth satellites orbiting independently or as lunar trojans, planetesimals left over from the formations of the terrestrial planets, Earth or Venus co-orbitals, and the breakup of a large main belt asteroid. Additional Earth satellites on independent orbits were shown to be quickly captured into resonances during the Moon's early tidally-driven orbital expansion and were lost or destroyed within in a few million years Lunar trojans were found to be destabilized within 100 million years by a solar resonance when the Moon reached 27 Earth radii. Planetesimals left over from the formation of the terrestrial planets were shown to be depleted too rapidly due to collisions and ejections to form the last lunar basins. The long-term stability of primordial Earth or Venus co-orbitals (trojans or objects with horseshoe orbits) in conjunction with the lack of current observations indicate that they were unlikely to have been common enough to contribute to the LHB. Producing the LHB from the collisional disruption of a main belt asteroid was found to require at minimum a 1,000–1,500 km parent body with the most favorable initial conditions. Debris produced by collisions among inner planets, now lost, has also been proposed as a source of the LHB. Evidence has been found for Late Heavy Bombardment-like conditions around the star Eta Corvi. ^ a b c Taylor, G. Jeffrey. "Wandering Gas Giants and Lunar Bombardment"
^ Claeys, Philippe; Morbidelli, Alessandro (1 January 2011). "Late Heavy Bombardment". In Gargaud, Muriel; Amils, Prof Ricardo; Quintanilla, José Cernicharo; Cleaves II, Henderson James (Jim); Irvine, William M.; Pinti, Prof Daniele L.; Viso, Michel. Encyclopedia of Astrobiology. Springer Berlin Heidelberg. pp. 909–912. doi:10.1007/978-3-642-11274-4_869. ISBN 978-3-642-11271-3. ^ Zahnle, K.; et al. (2003). "Cratering rates in the outer Solar System". Icarus. 163 (2): 263–289. Bibcode:2003Icar..163..263Z. CiteSeerX 10.1.1.520.2964. doi:10.1016/s0019-1035(03)00048-4. ^ Tera, F.; Papanastassiou, D.A. ; Wasserburg, G.J. (1974). "Isotopic evidence for a terminal lunar cataclysm". Earth Planet. Sci. Lett. 22 (22): 1–21. Bibcode:1974E&PSL..22....1T. doi:10.1016/0012-821x(74)90059-4. ^ Cohen, B. A.; Swindle, T. D.; Kring, D. A. (2000). "Support for the Lunar Cataclysm Hypothesis from Lunar Meteorite Impact Melt Ages". Science. 290 (5497): 1754–1755. Bibcode:2000Sci...290.1754C. doi:10.1126/science.290.5497.1754. PMID 11099411. ^ Hartmann, William K.; Quantin, Cathy; Mangold, Nicolas (2007). "Possible long-term decline in impact rates: 2. Lunar impact-melt data regarding impact history". Icarus. 186 (1): 11–23. Bibcode:2007Icar..186...11H. doi:10.1016/j.icarus.2006.09.009. ^ Marchi, S.; Bottke, W. F.; Cohen, B. A.; Wünnemann, K.; Kring, D. A.; McSween, H. Y.; de Sanctis, M. C.; O'Brien, D. P.; Schenk, P.; Raymond, C. A.; Russell, C. T. (2013). "High-velocity collisions from the lunar cataclysm recorded in asteroidal meteorites". Nature Geoscience. 6 (4): 303–307. Bibcode:2013NatGe...6..303M. doi:10.1038/ngeo1769. ^ Strom, R. G. (1979). "Mercury – A post-Mariner 10 assessment". Space Science Reviews. 24 (1): 3–70. Bibcode:1979SSRv...24....3S. doi:10.1007/bf00221842. ^ Veverka, Joseph (1985). "section 3.3.1. Chronology of Planetary Surfaces: Mercury". Planetary Geology in the 1980s. Washington D.C.: NASA. ^ Boehnke, P.; Harrison, T.M. (2016). "Illusory Late Heavy Bombardments". PNAS. 113 (39): 10802–10806. Bibcode:2016PNAS..11310802B. doi:10.1073/pnas.1611535113. PMC 5047187. PMID 27621460. ^ Hartmann, W. K. (2003). "Megaregolith evolution and cratering cataclysm models – Lunar cataclysm as a misconception (28 years later)". Meteoritics & Planetary Science. 38 (4): 579–593. Bibcode:2003M&PS...38..579H. doi:10.1111/j.1945-5100.2003.tb00028.x. ^ Ryder, Graham (2002). "Mass flux in the ancient Earth-Moon system and benign implications for the origin of life on Earth". Journal of Geophysical Research: Planets. 107 (E4): 6–1–6–13. Bibcode:2002JGRE..107.5022R. doi:10.1029/2001JE001583. hdl:2060/20030071675. ^ Ryder, G. (2000). "Heavy Bombardment on the Earth at ~3.85 Ga: The Search for Petrographic and Geochemical Evidence". Origin of the Earth and Moon: 475. Bibcode:2000orem.book..475R. ^ Bowring, Samuel A.; Williams, Ian S. (1999). "Priscoan (4.00–4.03 Ga) orthogneisses from northwestern Canada". Contributions to Mineralogy and Petrology. 134 (1): 3. Bibcode:1999CoMP..134....3B. doi:10.1007/s004100050465. ^ Tenenbaum, David (October 14, 2002). "When Did Life on Earth Begin? Ask a Rock". Astrobiology Magazine. Retrieved April 13, 2014. ^ Nutman, A.P; Friend, C.R.L (2006). "Petrography and geochemistry of apatites in banded iron formation, Akilia, W. Greenland: Consequences for oldest life evidence". Precambrian Research. 147 (1–2): 100–106. Bibcode:2006PreR..147..100N. doi:10.1016/j.precamres.2006.02.005. ^ Lepland, Aivo; Zuilen, Mark A. van; Arrhenius, Gustaf; Whitehouse, Martin J.; Fedo, Christopher M. (1 January 2005). "Questioning the evidence for Earth's earliest life—Akilia revisited". Geology. 33 (1): 77–79. Bibcode:2005Geo....33...77L. doi:10.1130/G20890.1. ^ Whitehouse, Martin J.; Myers, John S.; Fedo, Christopher M. (1 March 2009). "The Akilia Controversy: field, structural and geochronological evidence questions interpretations of >3.8 Ga life in SW Greenland". Journal of the Geological Society. 166 (2): 335–348. doi:10.1144/0016-76492008-070 – via jgs.lyellcollection.org. ^ Courtland, Rachel (July 2, 2008). "Did newborn Earth harbour life?". New Scientist. Retrieved April 13, 2014. ^ Steenhuysen, Julie (May 20, 2009). "Study turns back clock on origins of life on Earth". Reuters. Retrieved April 13, 2014. ^ "Scientists reconstruct ancient impact that dwarfs dinosaur-extinction blast". American Geophysical Union. April 9, 2014. ^ R. Gomes; H. F. Levison; K. Tsiganis; A. Morbidelli (2005). "Origin of the cataclysmic Late Heavy Bombardment period of the terrestrial planets". Nature. 435 (7041): 466–469. Bibcode:2005Natur.435..466G. doi:10.1038/nature03676. PMID 15917802. ^ Gomes, R.; Levison, H. F.; Tsiganis, K.; Morbidelli, A. (2005). "Origin of the cataclysmic Late Heavy Bombardment period of the terrestrial planets". Nature. 435 (7041): 466–469. Bibcode:2005Natur.435..466G. doi:10.1038/nature03676. PMID 15917802. ^ Morbidelli, Alessandro; Tsiganis, Kleomenis; Crida, Aurélien; Levison, Harold F.; Gomes, Rodney (2007). "Dynamics of the Giant Planets of the Solar System in the Gaseous Protoplanetary Disk and Their Relationship to the Current Orbital Architecture". The Astronomical Journal. 134 (5): 1790–1798. arXiv:0706.1713. Bibcode:2007AJ....134.1790M. doi:10.1086/521705. ^ Levison, Harold F.; Morbidelli, Alessandro; Tsiganis, Kleomenis; Nesvorný, David; Gomes, Rodney (2011). "Late Orbital Instabilities in the Outer Planets Induced by Interaction with a Self-gravitating Planetesimal Disk". The Astronomical Journal. 142 (5): 152. Bibcode:2011AJ....142..152L. doi:10.1088/0004-6256/142/5/152. ^ Brasser, R.; Morbidelli, A.; Gomes, R.; Tsiganis, K.; Levison, H. F. (2009). "Constructing the secular architecture of the solar system II: the terrestrial planets". Astronomy and Astrophysics. 507 (2): 1053–1065. arXiv:0909.1891. Bibcode:2009A&A...507.1053B. doi:10.1051/0004-6361/200912878. ^ Morbidelli, Alessandro; Brasser, Ramon; Gomes, Rodney; Levison, Harold F.; Tsiganis, Kleomenis (2010). "Evidence from the Asteroid Belt for a Violent Past Evolution of Jupiter's Orbit". The Astronomical Journal. 140 (5): 1391–1401. arXiv:1009.1521. Bibcode:2010AJ....140.1391M. doi:10.1088/0004-6256/140/5/1391. ^ Bottke, W.F., et al., 2012, An Archaean heavy bombardment from a destabilized extension of the asteroid belt, Nature, 485, pp. 78–81. ^ Nesvorný, David (2011). "Young Solar System's Fifth Giant Planet?". The Astrophysical Journal Letters. 742 (2): L22. arXiv:1109.2949. Bibcode:2011ApJ...742L..22N. doi:10.1088/2041-8205/742/2/L22. ^ Johnson, Brandon C.; Collins, Garath S.; Minton, David A.; Bowling, Timothy J.; Simonson, Bruce M.; Zuber, Maria T. (2016). "Spherule layers, crater scaling laws, and the population of ancient terrestrial impactors". Icarus. 271: 350–359. Bibcode:2016Icar..271..350J. doi:10.1016/j.icarus.2016.02.023. hdl:10044/1/29965. ^ Nesvorny, David; Roig, Fernando; Bottke, William F. (2016). "Modeling the Historical Flux of Planetary Impactors". The Astronomical Journal. 153 (3): 103. arXiv:1612.08771. Bibcode:2017AJ....153..103N. doi:10.3847/1538-3881/153/3/103. ^ Nakano, T. (1 January 1987). "Formation of planets around stars of various masses. I – Formulation and a star of one solar mass". Monthly Notices of the Royal Astronomical Society. 224: 107–130. Bibcode:1987MNRAS.224..107N. doi:10.1093/mnras/224.1.107 – via NASA ADS. ^ G. J. Taylor (August 21, 2001). "Uranus, Neptune, and the Mountains of the Moon". Planetary Science Research Discoveries. ^ Brasser, R; Morbidelli, A. (2011). "The terrestrial Planet V hypothesis as the mechanism for the origin of the late heavy bombardment". Astronomy & Astrophysics. 535: A41. Bibcode:2011A&A...535A..41B. doi:10.1051/0004-6361/201117336. ^ Minton, D. A.; Jackson, A. P.; Asphaug, E.; Fassett, C. I.; Richardson, J. E. (2015). "Debris from Borealis Basin Formation as the Primary Impactor Population of Late Heavy Bombardment" (PDF). Workshop on Early Solar System Impact Bombardment III: No. 1826, 3033. ^ Minton, David A.; Richard, James E.; Fassett, Caleb I. (2015). "Re-examining the main asteroid belt as the primary source of ancient lunar craters". Icarus. 247: 172–190. arXiv:1408.5304. Bibcode:2015Icar..247..172M. doi:10.1016/j.icarus.2014.10.018. ^ Ćuk, Matija (2012). "Chronology and sources of lunar impact bombardment". Icarus. 218 (1): 69–79. arXiv:1112.0046. Bibcode:2012Icar..218...69C. doi:10.1016/j.icarus.2011.11.031. ^ Ćuk, Matija; Gladman, Brett J.; Stewart, Sarah T. (2010). "Constraints on the source of lunar cataclysm impactors". Icarus. 207 (2): 590–594. arXiv:0912.1847. Bibcode:2010Icar..207..590C. doi:10.1016/j.icarus.2009.12.013. ^ Malhotra, Renu; Strom, Robert G. (2011). "Comment on "Constraints on the source of lunar cataclysm impactors"". Icarus. 216 (1): 359–362. Bibcode:2011Icar..216..359M. doi:10.1016/j.icarus.2010.11.037. ^ Ćuk, Matija; Gladman, Brett J.; Stewart, Sarah T. (2011). "Rebuttal to the comment by Malhotra and Strom on "Constraints on the source of lunar cataclysm impactors"". Icarus. 216 (1): 363–365. Bibcode:2011Icar..216..363C. doi:10.1016/j.icarus.2011.08.011. ^ Fassett, C. I.; Head, J. W.; Kadish, S. J.; Mazarico, E.; Neumann, G. A.; Smith, D. E.; Zuber, M. T. (2012). "Lunar impact basins: Stratigraphy, sequence and ages from superposed impact crater populations measured from Lunar Orbiter Laser Altimeter (LOLA) data". Journal of Geophysical Research. 117 (E12): n/a. Bibcode:2012JGRE..117.0H06F. doi:10.1029/2011JE003951. ^ Marchi, Simone; Bottke, William F.; Kring, David A.; Morbidelli, Alessandro (2012). "The onset of the lunar cataclysm as recorded in its ancient crater populations". Earth and Planetary Science Letters. 325: 27–38. Bibcode:2012E&PSL.325...27M. doi:10.1016/j.epsl.2012.01.021. ^ Cuk, M. (2008). "Orbital Evolution of the Moon and the Lunar Cataclysm" (PDF). Workshop on the Early Solar System Impact Bombardment: LPI Contribution No. 1439 p. 29. ^ Ćuk, Matija; Gladman, Brett J. (2009). "The fate of primordial lunar Trojans". Icarus. 199 (2): 237–244. Bibcode:2009Icar..199..237C. doi:10.1016/j.icarus.2008.10.022. ^ Bottke, Wiliam F.; Levison, Harold F.; Nesvorný, David; Dones, Luke (2007). "Can planetesimals left over from terrestrial planet formation produce the lunar Late Heavy Bombardment?". Icarus. 190 (1): 203–223. Bibcode:2007Icar..190..203B. doi:10.1016/j.icarus.2007.02.010. ^ Cuk, M.; Hamilton, D. P.; Holman, M. J. (2012). "Long-term stability of horseshoe orbits". Monthly Notices of the Royal Astronomical Society. 426 (4): 3051–3056. arXiv:1206.1888. Bibcode:2012MNRAS.426.3051C. doi:10.1111/j.1365-2966.2012.21964.x. ^ Ito, Takashi; Malhotra, Renu (2006). "Dynamical transport of asteroid fragments from the ν6 resonance". Advances in Space Research. 38 (4): 817–825. arXiv:astro-ph/0611548. Bibcode:2006AdSpR..38..817I. doi:10.1016/j.asr.2006.06.007. ^ Volk, Kathryn; Gladman, Brett (2015). "Consolidating and Crushing Exoplanets: Did It Happen Here?". The Astrophysical Journal Letters. 806 (2): L26. arXiv:1502.06558. Bibcode:2015ApJ...806L..26V. doi:10.1088/2041-8205/806/2/L26. ^ Spitzer Observations of η Corvi : Evidence at ~1 Gyr for an LHB-Like Delivery of Organics & Water-Rich Material to the THZ of a Sun-Like Star. C.M. Lisse, C. H. Chen, M. C. Wyatt, A. Morlok, P. Thebault, G. Bryden, D.M. Watson, P. Manoj, P. Sheehan, G. Sloan, T.M. Currie, Lunar and Planetary Institute Science Conference Abstracts' 42, (March 20, 2011), p. 2438, Bibcode: 2011LPI....42.2438L. G. Jeffrey Taylor (August 24, 2006). "Wandering Gas Giants and Lunar Bombardment". Planetary Science Research Discoveries. Barbara Cohen (January 24, 2001). "Lunar Meteorites and the Lunar Cataclysm". Planetary Science Research Discoveries. Ker Than, "New Insight into Earth’s Early Bombardment" – Space.com, April 17, 2006. Late Heavy Bombardment was asteroidal, not cometary, The Geological Society, March 4, 2002. Robert Roy Britt, "Evidence for Ancient Bombardment of Earth," – Space.com, July 24, 2002.